When a movie comes touted as Alfred Hitchcock’s favorite creation, that creates a pretty high level of expectations in the viewer. Does 1943’s Shadow of a Doubt live up to its billing? Probably not, but it presents a fine piece of work, even if I wouldn’t call it Hitchcock’s best. Doubt starts with a quick scene in Philadelphia. A pair of mysterious men pursue Charles Oakley (Joseph Cotton), but he gives them the slip. Charles decides to get out of town, so he heads to California to visit his sister Emma (Patricia Collinge) and her family. By coincidence, his niece Charlie (Teresa Wright) plans to invite him to “rescue” the family. Charlie feels the family suffers from a rut and they need Charles to “save” them. She adores her uncle, and even though he exhibits some odd behaviors, she remains convinced that he can do no wrong. This starts to change when a detective named Jack Graham (Macdonald Carey) comes onto the scene. He tells Charlie that he’s in pursuit of a mystery man and he suspects Charles might be the one he wants to find. Charlie resists this notion but starts to wonder about her uncle. The flick follows this plot line as it thickens. Doubt provides a significant contrast when compared to Saboteur, Hitchcock’s prior release. While the latter launches with a bang and engages us with its plot almost literally from Minute One, Doubt moves at a much more deliberate pace. Indeed, we pass the flick’s halfway mark before we get the slightest clue what plot it intends to pursue. I admit that the manner in which the story unspools can feel like water torture. Hitchcock barely tips his hand during the first hour, and it can feel a little maddening to be forced to wait so long to sense the movie’s path. I suppose that this slow story evolution probably felt even more unnerving since I watched Saboteur right before I took in Doubt, a fact that made the contrast more pronounced. Hitchcock being Hitchcock, however, Doubt always stays interesting despite the frustrations prompted by its glacial pacing. At least at thar stage of his career, I don’t think Hitchcock could’ve made a dull movie even if he’d tried. That doesn’t mean all 1940s Hitchcock flicks are equally good, but I do think that he worked at a consistently high level. In the case of Doubt, the film progresses in a much more subtle manner when compared to Saboteur. That flick featured little subtext, while Doubt comes packed with elements that bubble under the surface, particularly in the relationship between Charles and Charlie. They show an almost symbiotic connection, as it often appears they’re connected emotionally and cognitively. The movie mostly hints at this, but it adds an unusual notion to the experience. We also get hints that Charles has an interest in Charlie beyond that of the caring uncle. Cotten gives his scenes with Wright an unsettling sexual vibe that makes us sense something’s amiss with Charles from the start. The film doesn’t make this explicit, and Cotten doesn’t overplay this side of the character, but I think the attitude exists – and it gives me the creeps. That’s what Hitchcock does best in Doubt: create an atmosphere of general tension without getting more specific. He doesn’t feel the need to hit us on the head with drama or terror, and the film benefits from this understated tone. Doubt comes with a constant sense of implied menace, so we can stand the wait to find out the nature of the threat. Of course, Doubt isn’t all darkness, as Hitchcock can’t resist a dose of black humor, here portrayed in the relationship between Charlie’s father Joe (Henry Travers) and his pal Herb (Hume Cronyn). Fascinated by cheap murder mystery magazines, they constantly try to invent the perfect methods they could use to kill each other. This running gag provides the needed laughs, but it also fits the movie and helps advance the main plot in an unconventional way. Even though we hear nothing about real murder for quite some time, the Joe/Herb side of things keeps this subject in our minds. Doubt feels unusual for Hitchcock, as much of the time it feels like he almost wants to make a Capra flick. (The presence of Travers – who would gain everlasting fame as an angel in 1946’s It’s a Wonderful Life - adds to this perception for us.) That homey sensibility makes Doubt something different. It lends a languid sense of pacing to the film, but it never becomes dull. This is a consistently involving piece of work. 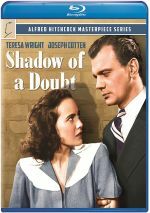 Shadow of a Doubt appears in an aspect ratio of 1.33:1 on this Blu-ray Disc. While a lot of the image looked good, some negatives came along for the ride. My biggest concerns stemmed from print flaws, as I noticed specks, spots, lines, nicks, hairs and blotches. Most of these manifested themselves in the movie’s first act, so the image managed to clean up as it progressed. However, bouts of defects still appeared; for instance, the scene in the bank manager’s office delivered blotches. At no point did the flaws become dominant, but they were heavier than I would’ve liked – and that I expected after the clean Saboteur. Sharpness was good most of the time. A smidgen of softness appeared on a couple of brief occasions, but those instances were minor. Most of the time the flick came across as well-defined and distinctive. No problems with jagged edges or shimmering occurred, and only a little edge enhancement appeared. Blacks looked nicely dark and tight, and shadows were good. None of the film’s low-light shots suffered from excessive opacity, so those scenes appeared smooth and clear. The print flaws knocked down my grade to a “B-“, which was a shame, as the rest of the presentation looked nice. I thought the monaural soundtrack of Doubt was decent. Speech showed a little edginess and usually seemed thin. Nonetheless, the lines offered good intelligibility across the board. Music seemed average, as the score and songs were somewhat shrill. They generally seemed acceptable given their age, though, and the harshness in the upper register wasn’t too intrusive. Effects seemed tinny and without heft, but that was expected. A little hiss and background noise accompanied the mix. This was an unspectacular but acceptable piece of audio for a movie from 1943. How does the Blu-ray compare to the prior 2005 DVD? Audio appeared to be very similar, as I thought the Blu-ray came with the same strengths and weaknesses. Visuals marked an improvement, though. Even with the print flaws, the Blu-ray was a bit cleaner, and it showed stronger definition and clarity. The Blu-ray duplicates most of the extras from the DVD, and the major component comes from a documentary called Beyond Doubt: The Making of Hitchcock’s Favorite Film. 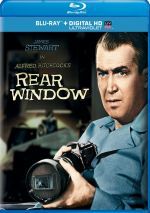 This 34-minute and 48-second shot provides notes from director’s daughter Pat Hitchcock O’Connell, filmmaker Peter Bogdanovich, associate art director Robert Boyle, and actors Teresa Wright and Hume Cronyn. We hear about the script’s genesis and development, cast and performances, Hitchcock’s style as director and visual choices, sets and shooting in Santa Rosa, some psychological and storytelling elements, and thoughts about the final product. Documentaries for older movies can find it tough to discuss these productions since so many participants have dird. That hampers “Beyond” to a minor degree, especially since it includes no film historians other than Bogdanovich. Nonetheless, the show still manages to cover its subject well. It comes with some interesting tales – especially about Cronyn’s casting – and both entertains and informs. In addition to the movie’s trailer, we get some stillframe bits. Under Production Drawings, we see 32 sketches by art director Robert Boyle. These show various sets and elements of the film; they range into storyboard territory at times but more often seem like conceptual pieces. Production Photographs includes 51 stills. These provide a nice mix of advertisements, publicity shots, and behind the scenes pictures. 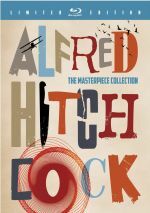 Apparently Alfred Hitchcock found Shadow of a Doubt to be his favorite of all the flicks he directed. I don’t think quite so highly of it, but I like it nonetheless. A quiet, brooding piece, it becomes a real winner. The Blu-ray provides generally positive visuals, adequate audio and a smattering of interesting bonus materials. I’d like to see the movie get a cleaner transfer, but it still offered a mostly good reproduction of a fine film.